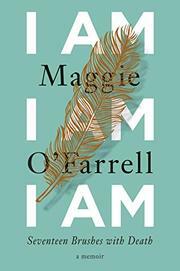 Established novelist and lovely person Maggie O’Farrell published I Am I Am I Am: Seventeen Brushes with Death in Europe October of last year and the memoir landed in the states this past February. My friend snagged a beautiful copy with that soft verdigris cover and deckle edges. It’s an incredibly transparent, bright, and vivid collection that goes on a bit too long (13 brushes of death, were enough? Maybe 11, keep it prime?). The chapters are organized by body part and the year affected. The most eerie accounts involve a brush with a serial killer (Neck 1990), a near plane crash (Whole Body 1993), a hold-up in Chile (Neck 2002) and a horrifying delivery (Abdomen 2003). Some of the accounts stretch credulity, and the intrepid Maggie’s lack of caution is a mild irritant. Throughout, her descriptions are mesmerizingly clear. On a man who nearly killed her on a deserted trail: “He wore knitted hats and patterned tank tops and too-small once-smart suits that were coated with cat-hair.” Though unfailing vivid, as these 17 ruminations on death approached 300 pages, the whole effect was perhaps too vivid. After awhile, I was left with a What-Now sensation. I loved how she pulled from the past and present, how her current knowledge interwove with her vivacious youthful self. Though intensely personal, none of the pieces are melodramatic or self-involved. “There is nothing unique or special in a near-death experience,” she writes early on. “They are not rare; everyone, I would venture, has had them, at one time or another, perhaps without even realising it.” O’Farrell brings the reader into her experience, our common experience, and makes them shiver with wonder and delight that they have (for the time being) escaped, as Dickens put it, Our Mutual Friend.